This attractive basket hilt is constructed with flattened guard bars of rectangular section decorated in typical “Glasgow” style with longitudinal flutes consisting of finely executed shallow filed grooves along the centre of each bar. The main and secondary guard panels are filed with delicate frets and merlons to the edges, incised with lines and pierced with patterns of circles and triangles. The hilt is solid without any evident repairs or breaks. 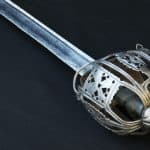 The conical pommel has a pronounced button on top filed with a double groove around its circumference and is decorated with four sets of grooves formed in a similar manner to those on the guard bars, and flanked with narrower incised lines, which radiate from the pommel button. Between these crescents have been applied in similar manner with the convex sides facing upwards. The arms of the basket fit into apronounced groove which extends for the full circumference around the pommel just below its middle. The spirally grooved wooden grip is covered with shagreen and bound with silver ribbon. Silver ferrules with crescent shaped convex inward facing edges, decorated with raised bands and dots are mounted top and bottom of the grip. The hilt retains a leather liner. The single edged tapering blade has a pronounced fuller extending from the hilt for most of its length either side underneath the spine. Between this and the cutting edge a second wider, shallower, fuller of similar length is present. The blade length is just under 33.5 inches (85 cm) and overall length 39.5 inches (100 cm). This hilt matches a known group of contemporary and similar hilts incised with the initials of the Glasgow maker John Simpson the Younger (II) and seem to date to the later period of his work. Simpson (II) died in 1749. 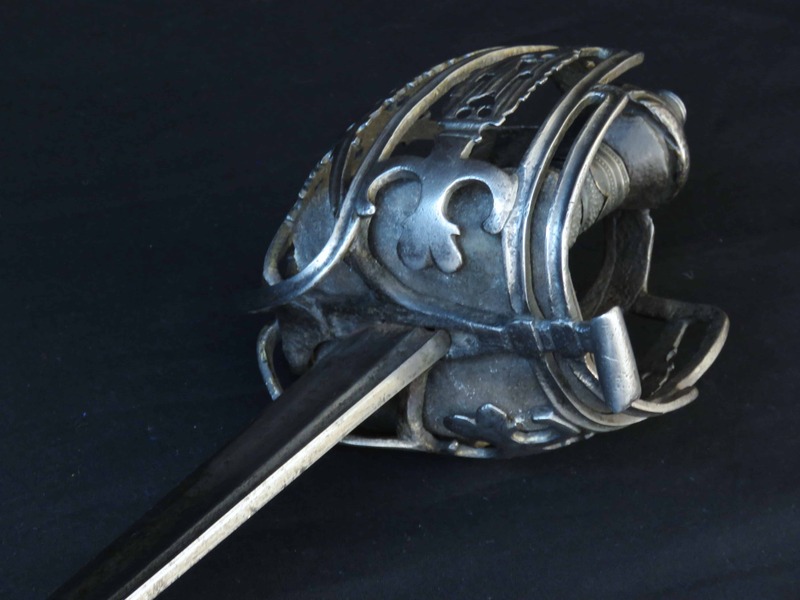 No initials are present on this sword but it was clearly made by one of the leading armourers in Glasgow in a similar style to Simpson (II). Similar swords signed by Simpson (II) are illustrated in Cyril Mazansky’s “British Basket-Hilted Swords”, Boydell Press, 2005. For example see pages 111, fig F15, 116, fig F16a). 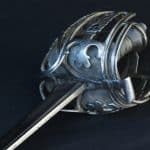 For further examples see Bonhams Arms & Armour sale, London, 1st December 2009, Lot 415, “The Property of a Gentleman, A Rare Scottish Basket-Hilted Broadsword, the Hilt by John Simpson the Younger of Glasgow”. Another similar example sold at Thomas Del Mar Ltd, London, Wednesday 7th December 2011, lot 157. 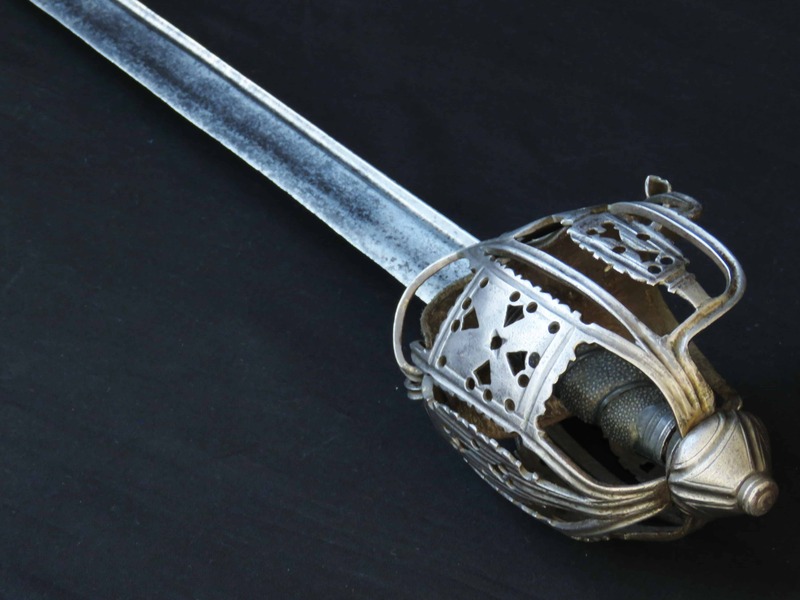 This sword is published in the February 2015 Park Lane Arms Fair catalogue in a paper entitled: “Notes on the dating of early Glasgow Style Scottish Basket-Hilted Swords”.